As James Olsen gets in too deep trying to find the leader of the Children of Liberty, Supergirl and Manchester Black join forces to root out the terrorist leader more directly... with deadly consequences for The Girl of Steel! Meanwhile, Lena prepares to start human trials in her efforts to find a way to accelerate human evolution using Harun-El. David Ajala continues to manage an impossible balancing act as Manchester Black. On the one hand, part of you can't help but love the guy and sympathize with him even as he pushes the limits of what Supergirl can ignore with his vigilantism. And then we find out just how far he's gone and.... well, you still sympathize with him and are left wondering, like Kara, how much of his betrayal was planned out and if he truly was counting on being able to save Supergirl on his own or her being able to free herself or if he truly was throwing her to the wolves only to change his mind and save her at the last moment. It's a complex performance that perfect captures the conflicted nature of the episode's core theme. The script of the episode is a brilliant piece of work, full of literary allusion and complex moral arguments one doesn't usually expect to see in a CW series. The fifth segment is well-directed, with some wonderful fight scenes and that final shot of Kara before the Torch of Liberty is a beautiful one. The final Manchester Black costume is a dead on perfect adaptation of the costume from the comics. The title of the episode is taken from a line from Mary Shelley's Frankenstein - "Remember that I am thy creature; I ought to be thy Adam, but I am rather the fallen angel, whom thou drivest from joy for no misdeed. Everywhere I see bliss, from which I alone am irrevocably excluded. I was benevolent and good; misery made me a fiend." The line itself is a reference to Milton's Paradise Lost and how Lucifer fell because it was God's will that he fall as part of the Divine Plan where as Adam fell because of his own free will. In this, the creature Dr. Frankenstein created suggests that he is only a monster because Frankenstein's neglect made him become one. The title somewhat mirrors the stories of most of its characters, who undertake monstrous actions in the name of love. James' efforts to investigate The Children of Liberty almost lead to him becoming a killer in the name of maintaining a cover. Manchester Black has already become a murderer because of his anger at losing Fiona to The Children of Liberty. And Lena is crossing several lines in her efforts to try and protect people by trying to create an equalizer for her species. Even Agent Liberty himself can be seen as an example of this, as his actions ultimately were born of his desire to protect his family and their employees. Lena makes reference to Nagel's Spider in The Shower Conundrum. In our reality, this is more commonly known as The Spider In The Urinal Conundrum. The story was told by philosopher Thomas Nagel that he noticed a spider in a urinal near his office and how the poor creature seemed to survived despite being urinated upon several times a day. One day, he used a paper towel to gently remove the spider from the gutter in which it was trapped and deposited it on the ground. A day later, he found the spider was where he had left it, quite dead. Nagel used this story to show the unintended consequences of altruism and how every often well meaning attempts at helping people could cause far greater harm than doing nothing. Shelley Island - the government base used to process alien immigrants to America - is clearly modeled on Ellis Island - the American base that handled processing immigrants in Manhattan until 1954. It is named in honor of Mary Shelley. Lena's efforts to turn ordinary humans into superhumans are similar to Lex Luthor's Everyman Project in the mini-series 52, allowing nearly anyone who could pay the price or was willing to sign on to Lex Luthor's corporate-owned superhero team to get superpowers. DISL Codes are the international standard for IDing freight containers. Out of over 100 applicants for Lena's experiment, all but 12 were acceptably risk-tolerant. Brainy says that the shipping label fragment couldn't be read. It was made up of 80% glue, 9.7% ink and the rest was Nalcyite - a.k.a. Nalcian table salt. Nalcian table salt can be quite volatile on Earth and under the right conditions it has an explosive factor of 8,000 joules per gram. This is equal to a small, precise nuclear explosion. Shelley Island has power-dampening pylons that prevent most alien powers from functioning there. Supergirl just happens to have a yellow sun grenade to boost her powers for when she goes into areas she knows will have power-dampening tech. Manchester has an armored vest with a Union Jack design on it that he slips on to fight the Agents of Liberty. Manchester uses an empathy amplifier against J'onn - a device that doubles the pain an empath feels in others but keeps them from letting it out. Adam showed signs of having extra-human powers for 3 minutes and 14 seconds before dying at 4:03 a.m.. Lena says that the experiment still gave her new information on the human genome despite his death. She predicts an 87% chance of success on future trails. Adam: Believe me. I've never been a hero. Adam: You ever lost someone, Dr. Kieran? Lena: Yes. She was the only hero I ever had. Tom: I guess this is what happens when we let fear guide us. James: But what is reputation? I mean, what is it? It's nothing. It's not who you are. So if the latest fringe group wants to tear that monument down, we will build it right back up. Agent Liberty can do whatever he wants with my reputation. I know who I am. Lena: Bad luck doesn't make you a bad person. Bad choices do. And I would know, because I am a much worse person than you. Manchester Black: I made a deal with our dead friend over there and he did not deliver. Maybe you can. Who is Agent Liberty? Fake Agent Liberty: If I tell you, you'll let me live? Adam: Please let me do something good. J'onn: You betrayed Supergirl, tonight! You betrayed me and your promise to Fiona! No vengeance is worth your soul! Manchester Black What soul, old man? J'onn: I saw the love you had for Fiona. How you fought for her! I also know what you're going to do. And I can't let you kill a man, even if that man is Agent Liberty. Once you cross that line, Manchester, there is no going back! Manchester Black: You have no idea what lines I've already crossed. (points to J'onn's chest.) You see that there? That's your heart beating. Mine is dead. (half-sobbing) And every time I close my eyes, and wait to hear Fi's voice? There's nothing! There's just silence. (shakes his head) I'm empty, man. Manchester Black: You want to know the truth? Look. J'onn: (pained) Why won't it stop? Manchester Black: It's an empathy amplifier. It was created to use against empaths. Double the hurt and keep everything in. If I can't escape this pain, neither can you..You shouldn't have believed in me. Lena: I'm so sorry, Adam. I moved the spider. Kara: Yeah, I've been thinking a lot about that too. Duality? How people can surprise you. Manchester Black is... bad. He killed people. He betrayed me. But... then he turned around to help me. James: Well, maybe he wasn't trying to help you? Maybe that was just a consequence. Kara: Yeah. I guess people only show you what they want you to see. And that's not always who they are. James: Yeah. I mean, look at me, I... I compromised myself tonight. Kara: You saved Tom's life. James: But I risked everything I've worked for. Everything. My reputation. My life (pauses) Your life. (pauses) You know, though - I guess I kinda understand a little better why Lena lied to me about the DA now. Kara: You should tell her that. 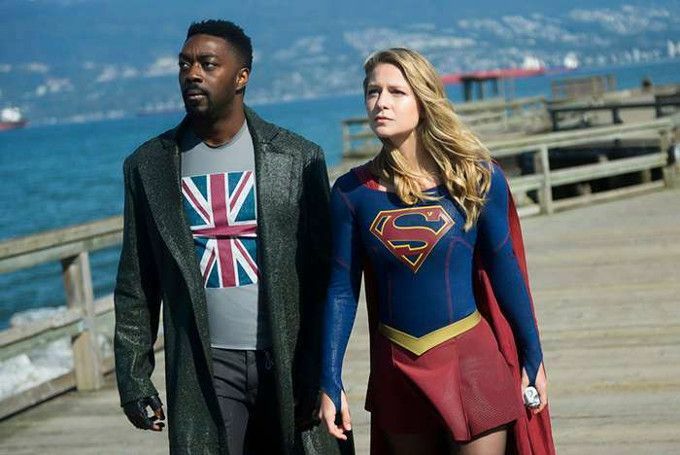 Supergirl and Manchester Black meet up after they stop a Child of Liberty from stealing fission rods from an alien-run factory. Supergirl agrees to contact Manchester if she learns anything about what The Children of Liberty are planning. Agent Liberty refuses to tell James anything about his motivations and instead asks him to destroy something that is a symbol of everything The Children of Liberty stand against. Lena's first test subect is given the designation Subject 331. He has nice green eyes, according to Eve Teschmacher. He is a Caucasian Male, 5'9", with brown hair. He has a three-inch scar on his left flank. He originally claims it was from a hockey injury but it is eventually revealed to have been from surgery to implant a kidney. Eve Teschmacher has a cousin with cancer in hospice care. The cousin has two daughters. Ben Lockwood's new TV show is called The Lockdown. His first episode is devoted to blaming Supergirl for the disappearance of five Agents of Liberty who were "peacefully protesting" on Thanksgiving. These agents are presumed to be the men killed by Manchester Black in 406. Tom, the Agent of Liberty whom James stopped from taking part in the Thanksgiving night attacks, gives James back his Guardian gear and helps him to escape. Shelley Island is an island base used by the US Government to process alien immigrants to Earth. It was shut down after President Marsdin resigned and The Children of Liberty turned it into a base. The container Manchester Black tracks down was a sub-zero unit. Supergirl finds part of a shipping label under it. Supergirl rejects Manchester's help after he beats up the dock foreman with brass kunckles to get answers without trying to ask for help first. Lema lies and says her name is Dr. Kieran when her test subject asks for her name. Lena chose Subject 331 because of Nagel's Spider in The Shower Conundrum - a multiple choice question regarding how one treats a spider stuck in a shower. Subject 331 was the only one who made the same choice as Lena - leave it alone because you don't know what the spider wants. Lena said she chose Subject 331 because of his response to The Shower Conundrum i.e. he showed no desire to be a hero (i.e. move the spider) but likewise didn't go out of his way to kill the spider just because he could. Lena's worst fear for her project involves creating another wannabe superhero whose power will outstrip their ability. Subject 331 had a brother who died who was a real hero and so perfect it was nauseating. The five dead Agents of Liberty are found. There's no evidence they were killed by aliens, with all five men having died from broken jaws, shattered skulls and gunshot wounds. Alex thinks the killings were personal. Kara asks if a person with brass kunckles could break someone's jaw. Alex says they could if they were strong enough. J'onn says he thinks Manchester could be a useful ally to Supergirl and says he is resourceful and clever even if he is stubborn and has a temper. J'onn says that under all his anger and pain he has a good heart. Supergirl gives Manchester a pot pie and offers to give him a second chance. Subject 331 confesses that his scar is from kidney surgery rather than a hockey injury. He also reveals that the reason his hero brother died is from complications donatings a kidney to save his life. He survived the transplant - his brother didn't survive having the kidney removed. Despite this, Lena stands by her decision when Subject 331 says he's a selfish person and he still wouldn't risk his life to save his brother if their situations had been reversed. Supergirl and Manchester deduce the container was meant to hold fission rods but that it was empty before it came to port. That means it had to be emptied out on an island. Since Shelley Island is powered by fission rods, they figure that it must have been turned into a base by the Children of Liberty. Manchester persuades Supergirl to go deal with Agent Liberty stealthily, without a big DEO team. Manchester disables Supergirl's yellow sun grenade so she is powerless when she arrives on Shelley Island. He did this in exchange for an audience with Agent Liberty. Subject 331's name is revealed to be Adam. Lena reveals the only hero she ever had was her birth mother, who died when she was four. Lena says that her mother drowned while she was swimming in a lake and that Lena just stood there and watched her die. Lena feels, on some level, that she was destined to be with the Luthors because of her own muted reaction to her birth mother's dying in front of her. Manchester was running a con on The Children of Liberty and deduces that he isn't meeting the real Agent Liberty when the "Agent Liberty" he makes reference to Fiona. Knowing that if The Children of Liberty knew who he was and knew he was engaged to an alien who was killed by The Children of Liberty, that there is no way they'd ever let him near their real leader, Manchester reveals himself and attacks. Manchester destroys the power-dampening pylons, allowing Supergirl to break free and remove the bombs before Shelley island is blown up. Adam convinces Lena not to discontinue the experiment and tells her that she's a good person for wanting to help people with this treatment. He later dies after showing signs of having powers for a little over three minutes. James goes to Lena and asks if they can talk about rekindling their romance. She asks to see him tomorrow instead. The final scene shows Manchester Black arriving at Lockwood Steel, suggesting he did learn Agent Liberty's true identity. Easily the strongest episode of the season so far. When Supergirl comes to an end, this will likely be remembered as one of its greatest, most well-written episodes. Things that seem to be plot-holes are later explained away as foreshadowing of various elements and the whole story is full of wit, allusion and complex morality. The only aspect in which it suffers is that Agent Liberty is made into more of an outright villain by his actions here, which removes the ambiguity that most of the other characters are meant to display. Yet even though his actions here represent a further push for the line, they are still well within the boundaries established by earlier episodes.